A checking account that works as hard as you do. Must-have features and tools to access your funds – when, where and how you choose. All of our checking accounts offer the must-have features and tools to bank with ease. Simplify your life with great account features for hassle-free banking. Check balances, pay bills and transfer funds anytime, anywhere. Save time by scheduling and paying your bills online or on your mobile device. Quickly deposit checks right now from your mobile device with mobile check deposit. Your Visa debit card comes embedded with chip technology so you can make purchases with a new degree of confidence. Learn more about card security. Over a hundred locations and fee free ATMs located throughout the Gulf South region. Get secure online access for up to 7 years of statements and reduce the risk of mail fraud. There is absolutely no cost to you and you will receive an email alert when your statement is available. Paper statements are also available for a fee. Our side-by-side comparison chart will help you sort through the details. 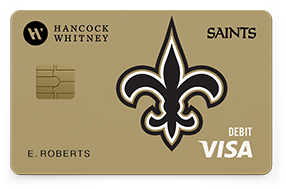 Are you a card-carrying Saints fan? Prove it with a Hancock Whitney Bank Saints Visa® Debit Card. Open your checking account today and let the world know you’re a true believer. Call 1-800-448-8812 or visit a financial center near you. 1 Direct deposits originating from any account, including a Hancock Whitney account, must be a qualifying direct deposit. Qualifying direct deposits includes a salary, pension, social security or other regular monthly income amount of $250 or more electronically deposited into the account by your employer or outside agency. Transfers from one account to another or deposits made at a financial center or ATM don't qualify as a direct deposit. Minimum $50 opening deposit required.